We created our own Shadow while we were young during socialization when we had to suppress a lot of our natural tendencies, but it’s also been added to almost continuously since. It’s not difficult to see that this is a place of conflict, resentment, trouble beyond imagining, and therefore, a marvelous place for the author to pursue story material. The problem of course is that, once unleashed, the Shadow can wreak havoc in Consciousness, at least under certain conditions. We do have safeguards, such as they are, against getting flooded by this Shadow material, and we’ll get to them a little later. [The Shadow] rests upon a deeper layer, which does not derive from personal experience and is not a personal acquisition but is inborn. This deeper layer I call the collective unconscious. I have chosen the term “collective” because this part of the unconscious is not individual but universal; in contrast to the personal psyche, it has contents and modes of behaviour that are more or less the same everywhere and in all individuals. It is, in other words, identical in all men and thus constitutes a common psychic substrate of a suprapersonal nature which is present in every one of us. If the Shadow is a dark lake, the Collective Unconscious is a vast ocean teeming with beings beyond imagining. Or actually, it is quite within our imaginative grasp if we have the courage to develop the tools necessary to navigate and mine this Universe of Unbelievability. These two aspects of the Unconscious are not universally identified. Freud only recognized the Personal Unconscious and practiced what is known as regression therapy, i.e., retrieving and resolving childhood trauma. Freudian psychology is therefore principally about the Shadow, although he didn’t call it that. His therapeutic process is certainly worthwhile, but what we’re after is the whole enchilada, and Jung is the only one who can lead us into the even darker and more mysterious world of the Collective Unconscious. Freud’s work is primarily of interest in the medical field, but Jung’s work, although equally effective for emotionally disturbed patients, is also aligned with the creative side of humanity. It’s not solely intended for use in psychotherapy and is associated with the arts. Here comes the problem. 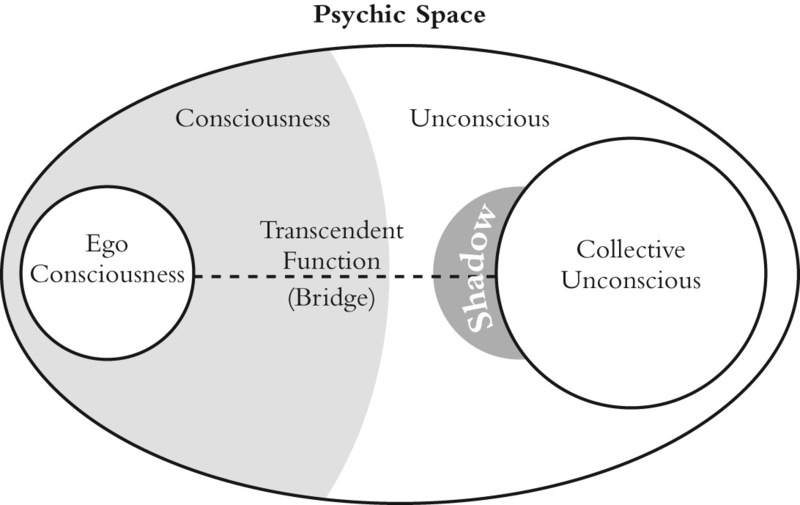 To get a clear view of the Collective Unconscious, we first must deal with the Personal Unconscious, the Shadow. The Shadow was generated during our formative years but always involved elements of the Collective Unconscious. As stated before, the contents of the Shadow are the repressed and suppressed elements of our psyche that were not socially acceptable. That’s why an author’s first work is frequently a coming-of-age novel. I have another confession. Back in 1986, after years of trying to write a novel with limited success, I took a course in creative writing at the University of Colorado from the poet Renate Wood (1938-2007). One of the first exercises she gave the class was to write a short piece of fiction about a character who was as different from ourselves as we could imagine. I immediately had an idea about a kid who was a senior in high school, belligerent, and fighting a lot. Although I’d been writing seriously for fifteen years, mostly poetry (I’d given up on novels), this was the hottest story I’d ever put on paper. Dr Wood liked what I wrote, and it was the first time I’d been told that I was writing publishable work. Three years later I had finished the rough draft of what was to become my first and bestselling novel, The Escape of Bobby Ray Hammer, and it came directly from that class assignment. The statement “many have perished in our work!” is an alchemical saying often quoted by Jung [Jung on Alchemy, page 2]. Since it comes from the alchemists, a certain amount of histrionics is undoubtedly involved, but it does allude to a real danger for some. I didn’t realize until years later that my writing had driven me into therapy. Six months into it, I started having panic attacks. After five years, I came out the other side, having gone, as it were, through the center of the cyclone. Not only that, it wreaked havoc on my personal and professional life. Writing can also do that because of its therapeutic aspects. If you’re getting to the good stuff, it can have its way with you. What had driven me into therapy had come from my Shadow, much of it from an almost fatal encounter with my father when I was twenty. Five years after starting writing that novel, which also involved father-son conflict, I was so emotionally and intellectually invested in writing that I quit my day job, and I’ve never gone back to astronautical engineering. So see? Writing with the intensity that I’m going to make available to you can have life-altering implications. When we write something as long as a novel or screenplay, we deal with material from more than just the Shadow. The Collective Unconscious always plays a role. This is the reason it is possible for you to write a good, well-plotted novel or screenplay without knowing about the plot pentagon. When we have a direct line to the Unconscious, stories can intuitively come out that way. Particularly if you’ve been writing since you were five. For those of us who have not, it takes more conscious knowledge of the process, and that comes with the plot pentagon and dodecahedron. For you, I’ve gone a step beyond what Dr Wood did for me. I’ve hardwired you to both your Shadow and Collective Unconscious. The good news is that both the Shadow and the Collective Unconscious contain material that is great for storytelling. The elements of the Shadow are certainly recognizable, but much of the contents of the Collective Unconscious may be rather foreign. How does this material from the Collective Unconscious appear to us when we experience it? The primordial image, or archetype, is a figure… that constantly recurs in the course of history… therefore, it is a mythological figure… When we examine these images more closely, we find that they give form to countless typical experiences of our ancestors. They are, so to speak, the psychic residua of innumerable experiences of the same type. They present a picture of psychic life in the average, divided up and projected into the manifold figures of the mythological pantheon. … In each of these images there is a little piece of human psychology and human fate, a remnant of the joys and sorrows that have been repeated countless times in our ancestral history, and on the average follow ever the same course. It is like a deeply graven river-bed in the psyche, in which the waters of life, instead of flowing along as before in a broad but shallow stream, suddenly swell into a mighty river. This happens whenever that particular set of circumstances is encountered which over long periods of time has helped to lay down the primordial image. When I placed my head on the pillow, I did not sleep, nor could I be said to think. My imagination, unbidden, possessed and guided me, gifting the successive images that arose in my mind with a vividness far beyond the usual bounds of reverie. I saw—with shut eyes, but acute mental vision—I saw the pale student of unhallowed arts kneeling beside the thing he had put together. I saw the hideous phantasm of a man stretched out, and then, on the working of some powerful engine, show signs of life, and stir with an uneasy, half-vital motion. Frightful must it be; for supremely frightful would be the effect of any human endeavour to mock the stupendous mechanism of the Creator of the world. …he might sleep in the belief that the silence of the grave would quench forever the transient existence of the hideous corpse which he had looked upon as the cradle of life. He sleeps; but he is awakened; he opens his eyes; behold, the horrid thing stands at his bedside, opening his curtains and looking on him with yellow, watery, but speculative eyes. I opened mine in terror. The idea so possessed my mind, that a thrill of fear ran through me… I recurred to my ghost story—my tiresome, unlucky ghost story! O! if I could only contrive one which would frighten my reader as I myself had been frightened that night! In concentrating on her ghost story at such a late hour just before sleep when her mind was already prepared — one might say over-prepared — for a psychic encounter, she was in direct contact with the Collective Unconscious. She saw images. They animated. She noticed the immediate hostility, conflict, inherent in her vision. She was emotionally engaged to the point of being terrorized by the vision. This was her prima materia. In using this psychic content for her novel, she “created” two of the most powerful archetypes of human existence: the mad scientist and his monstrous creation. Those two archetypes would fascinate her 19th century world and that of the 20th and 21st centuries as well. And tell her story, she did. The story Mary fashioned in the coming months caught the public’s attention immediately after publication, and through some 200 years, has never gone out of print. Indeed, the story is much alive today, hardly a year going by without another variation of it appearing on the big screen. The scientific discoveries of nuclear energy and DNA engineering have caused a lot of concern about the direction life on Earth has taken. We’re concerned that our use of scientific discoveries might destroy us, and we frequently use Mary’s story as a metaphor to illustrate the magnitude of the problem. Since story is about conflict, I need to address the types of conflict that come from the Shadow and the Collective Unconscious and what characterizes each. I don’t want to go too far in stereotyping the two, but they are most certainly different. The types of conflict that come from the Shadow, for normal people with rather benign childhoods, tend to be shallow personal stuff. They result in bickering and pettiness and in the end aren’t always that interesting. And this is where Richard Walter’s comment concerning enlightened, reasonable, rational discourse and courtesy, consideration, and consensus being boring runs into trouble. Nothing is more boring than trivial, unmotivated, trumped-up conflict. We’ve all tried to sit through movies that concern only the bickering of sibling rivalries and/or pointless power struggles. Remember that the Shadow is about the conflicts we suffered and lost when becoming socialized, so you know it’s not always going to be profound. But family issues and power struggles arise from the Collective Unconscious as well as the Shadow, so it’s not a total loss by any means. It’s just that if your story stays with material from the Shadow, it’ll never be as profound as one that also pulls from the Collective Unconscious, and may never get far beyond the trivialities of life. Classics such as Cinderella, Alice and Wonderland, Rapunzel, Hansel and Gretel, Sleeping Beauty, all are told at least partially from the Collective Unconscious. But don’t get the idea that this is a static place. The archetypes evolve, as do all aspects of human existence. They manage to express their dynamic positions from within the depths of the psyche. And yes, the Collective Unconscious heavily influences stories like The Matrix, which has central themes about enslavement and false realities. As stated before, the Shadow and the Collective Unconscious are not fully disconnected and unrelated. In the way I’ve graphically drawn them above in Figure 5-1, I’ve shown the two joined. The truth is traumas that create the Shadow can activate a resonate portion of the Collective Unconscious. This can create a profound psychological disturbance that rocks an individual’s psychic space. No one gets out of this life without being tried. Meaning in its purest sense is confirmation from the Collective Unconscious. Just as the creative impulse spontaneously generates from the Collective Unconscious, meaning also seemingly comes out of nowhere but ultimately is traceable to an impulse from the Collective Unconscious. We speak of truth as something that just makes sense, but that’s because it resonates with a region of the psyche where such processes are not available for introspection. We now have some of the tools to help us locate our story material and even a way of organizing it, a good portion of it anyway. What we’re after is a process to mine the treasure trove of the Collective Unconscious. We have a plot pentagon in the form of a yantra/mandala, and we know that both yantras and mandalas are used as aids during meditation. Is this the full story? Do we have all the ingredients? Of course, the answer is no. What about sub-plots and narration? Story structure is much more complex. Where are the missing elements? Let’s take another stab at that Philosopher’s Stone.